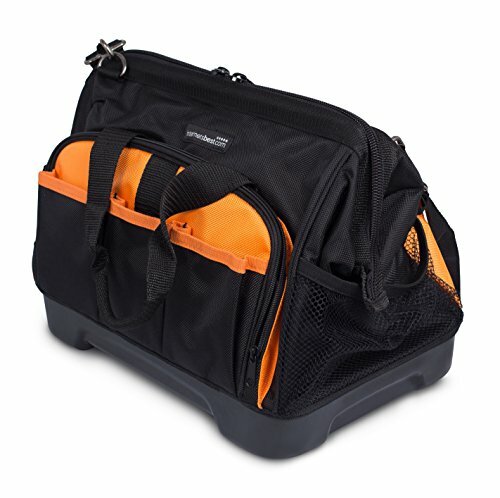 When it comes to tool bags, you need something that is easy to transport, durable, and has lots of space too. So, let’s get right into it and look at 5 different options, all of which are top contenders for the title of the best tool bag. 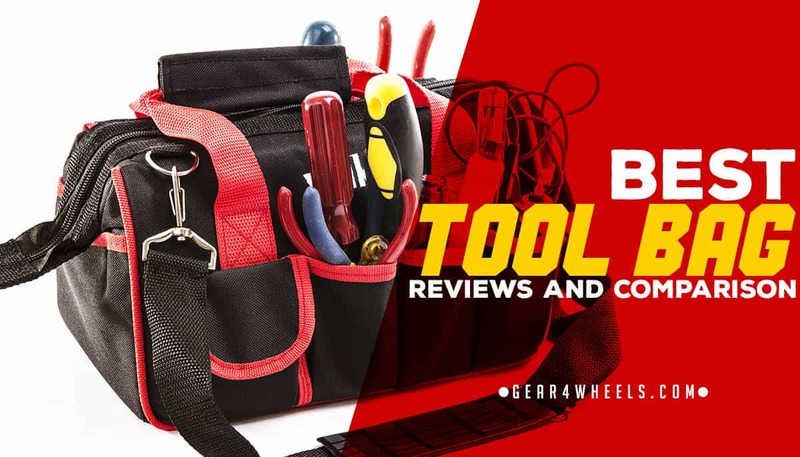 ExtremepowerUS makes some great tool-related products, with this particular rolling tool bag being one of the best in its class. The XtremepowerUS 18" Rolling Tool Bag is a great choice thanks to its maneuverability. Instead of carrying your tool bag, now you can simply pull it behind you like a small suitcase. It comes with extra-durable wheels perfect for the jobsite, plus a telescoping handle for life made easy. It even features a carrying handle in case some stairs get in your way. 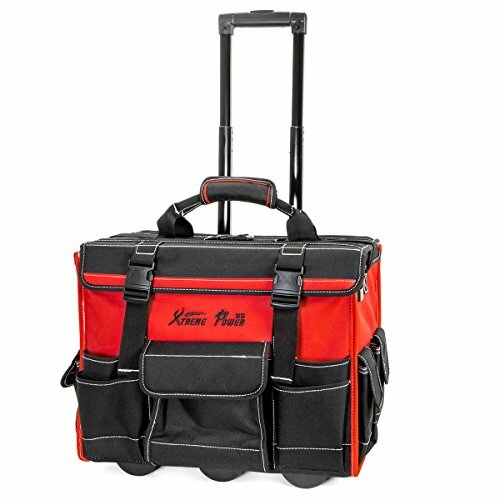 The XtremepowerUS 18" Rolling Tool Bag is made of water resistant polyester, which is pretty cool. Polyester may not be the absolute strongest material around, but the advanced stitching and build here do make this tool bag very durable. The fact that it will not let water get to your tools is a big factor here. Tools should not get wet, and when they are in this bag, they won’t. This tool bag has plenty of room on the inside. It has 1 large pocket with a wide mouth opening and dual zippers for easy access. It also comes with 10 internal pockets and 9 external pockets of varying sizes. Fitting all of the tools you need for the day should be no issue when you have the XtremepowerUS 18" Rolling Tool Bag in your arsenal. 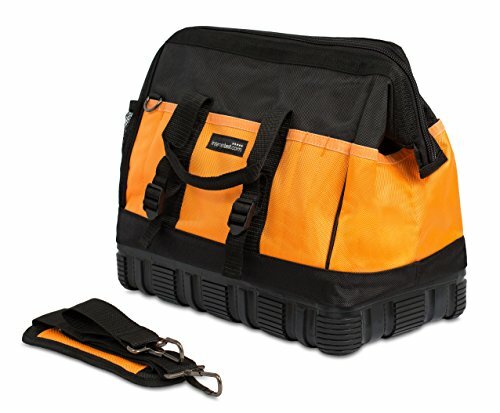 This reinforced synthetic tool bag from Carhartt is perfect for a long day on the job. It’s durable, has plenty of space, and convenient too. The Carhartt Legacy Carhartt Brown Tool Bag is made out of really nice synthetic fabric. This may not sound like much, but the synthetic fabric used here is meant to be extra-tough and durable. Carrying heavy weight is not a problem, especially because of the triple needle reinforced stitching. It also comes with a metal frame for some added stability and durability, plus it has an abrasion resistant base too. As you can see, tough is a word that definitely applies to this tool bag. It even uses Rain Defender to help waterproof it and keep moisture on the outside. The Carhartt Legacy Carhartt Brown Tool Bag has YKK zippers on the main compartment for easy access to the interior. The big interior pocket and 11 smaller interior pockets are great for all of your tools and accessories, plus the 23 external pockets help a lot too. The comfortable carrying handle makes bringing this bag with you on the go a breeze. 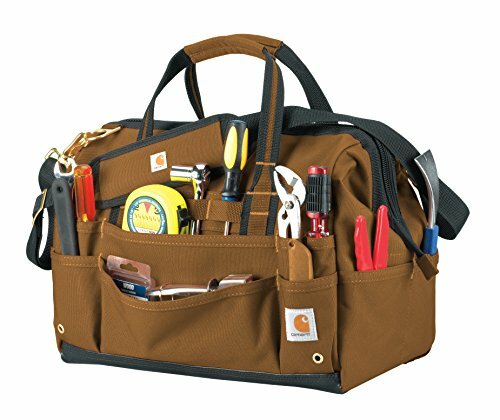 This modern-looking tool bag is a great way to keep your tools organized on the jobsite. When it comes to pockets, the Custom Leathercraft CLC Custom 1539 definitely has a whole lot of them. First off, it has a large main zippered compartment that is ideal for decent sized power tools such as drills. It also has several larger outer compartments, each of which contains 18 smaller pockets, plus the larger compartments have zippers so your tools don’t fall out. The Custom Leathercraft CLC Custom 1539 also comes with 7 exterior pockets, a carabineer, and a measuring tape clip too. 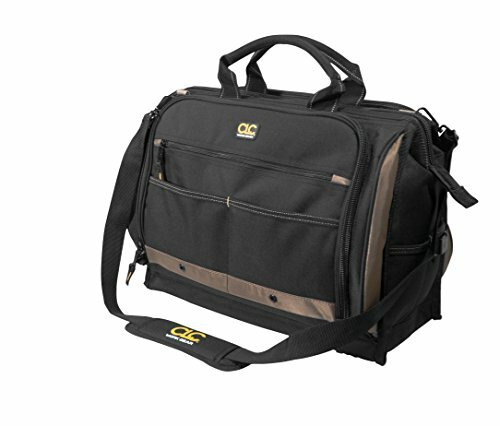 When it comes to carrying all of the tools you need for a long day, this tool bag is a great option to keep in mind. There is also the fact that it is a great option for keeping all of your tools, big and small, organized and ready to go at a moment’s notice. The Custom Leathercraft CLC Custom 1539 is very durable and secure, which is thanks to the poly fabric construction and addition of poly ballistic trim. Some bags are known for being somewhat weak and having seams that easily come apart, but that is definitely not the case with this particular tool bag. It is built to be tough, durable, and carry some pretty heavy tools. The outer compartments all have zippers, so your tools don’t fall out and move around. To make carrying this tool bag a little easier, it comes with a comfortably padded and adjustable shoulder carrying strap. It may look like an ordinary tool bag, but the Internet's Best Soft Sided Tool Bag is actually a great choice for several reasons. The Internet's Best Soft Sided Tool Bag is a very durable option indeed. It is made with 600d fabric, which is about as tough as it gets when it comes to this kind of thing. It may have a soft side, but being soft doesn’t mean that it is not durable. It is well able to stand up to large amounts of wear and tear. It is also finished with waterproofing to make sure that absolutely no moisture gets to the inside. The hard plastic bottom is something else that you might like. It helps keep the Internet's Best Soft Sided Tool Bag from being damaged from the bottom, plus it helps add some stability and extra ruggedness too. The mouth of this bag is zippered for easy access, plus it is extra-wide, so you can get stuff out quickly. The Internet's Best Soft Sided Tool Bag features one large open internal compartment and 18 smaller pockets all around the exterior. It’s great for larger tools on the inside and some smaller stuff on the outside. That being said, it is not the best in terms of organization. Also, it comes with padded carrying straps and a shoulder strap for easy transportation. This Internet's Best Soft Sided Tool Bag is a smaller version of the previous one we just talked about. The Internet's Best Soft Sided Tool Bag is a nice option to go with. It is very similar in every way to the previous one we just looked at, with the exception of being a little smaller. It is made with ultra-tough 600d fabric, it is great at withstanding wear and tear, plus it is totally waterproof too. It does have a solid base for some added protection. Once again, there is quite a bit of room for tools, but it is not great for organizational purposes. The padded shoulder strap and carrying handles make carrying it around a little easier. 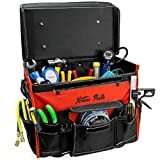 At the end of the day, the XtremepowerUS 18" Rolling Tool Bag is probably your very best option to go with. It is made with very tough materials, it is waterproof, it has wheels and a handle for easy transportation, plus it has tons of space and lots of pockets. All in all, it makes for the best tool bag on this list today.